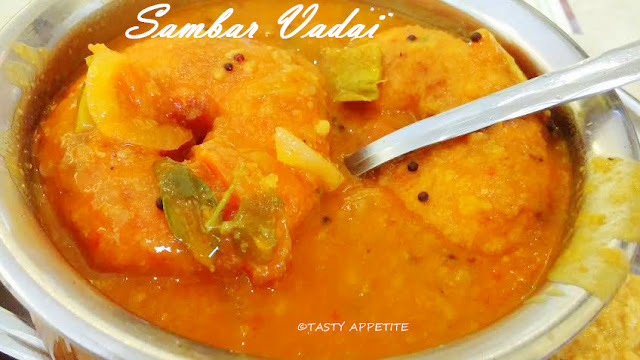 Here goes the hotel style Sambar Vadai recipe, a delightful dish from the South Indian cuisine which is famous all over the world. It can be served as a main course, side dish or snack. 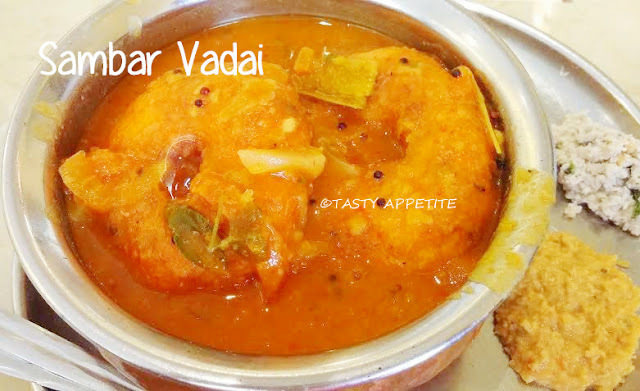 The crispy delicious puffy urad vada is prepared and dipped in hot sambar. It tastes extremely appetizing with its distinctive Indian fragrance and we cannot stop taking one. So what’s not to love this favorite dish…enjoy the easy recipe..! 1. Wash and soak toor dal for 5 mins. 2. Add it to pressure cooker. 4. Add enough water and pressure cook until soft and mushy. 5. Heat oil in a non-stick cook ware. 6. Add mustard, cumin, split urad dal, red chilly, curry leaves. 8. Add, hing, onions, garlic and fry for a minute. 9. Add tomatoes and fry till they turns soft and oils shows up on sides. 11. 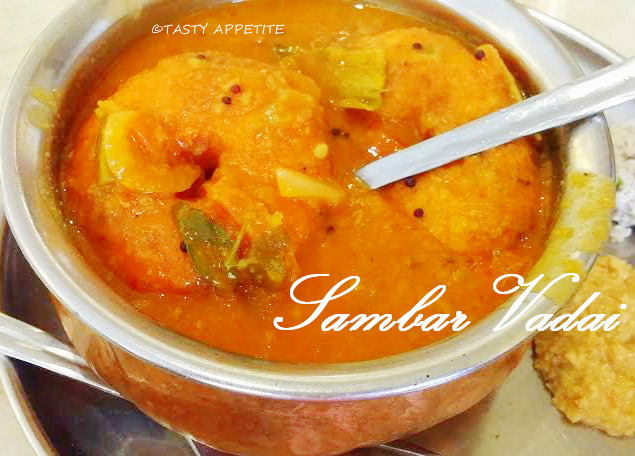 Add turmeric pwd, red chilly pwd, coriander pwd and 1 tsp of freshly prepared sambar pwd. 12. Add 1 cup of water and allow to cook for a while. 13. Once the veggies are cooked, add the cooked lentils. 15. Taste and adjust salt and seasonings. 16. Add tamarind paste and remaining sambarpwd. 17. Sprinkle freshly chopped coriander leaves. 19. Flavorful hotel style tiffin sambar is ready. 1. Wash and soak urad dal for 2 to 3 hours. 2. Drain off excess water and add it to blender. 3. Add salt, green chilly and grind it to smooth paste. 4. Add finely sliced onions, curry leaves, coriander leaves and hing. 5. The consistency of the batter should not be too tight or watery. 6. Heat up oil in deep frying pan. 7. Wet your palm and take a small ball of batter. 8. Pat it flat and make a small hole in the centre. 9. Drop it carefully in the hot oil. 10. Deep fry till golden to reddish brown on both sides. 11. Let the outer vada turn nice and crispy. 12. Drain and set aside. 13. Take warm water in a small bowl. 14. Add the vada one by one, let it soak for a while. 15. Strain and keep it aside. 16. Vadas are ready to be added to sambar. 1. Take the Vadas in serving bowl. 2. Pour generous amount of hot sambar all over. 3. Garnish with finely chopped coriander leaves. 5. 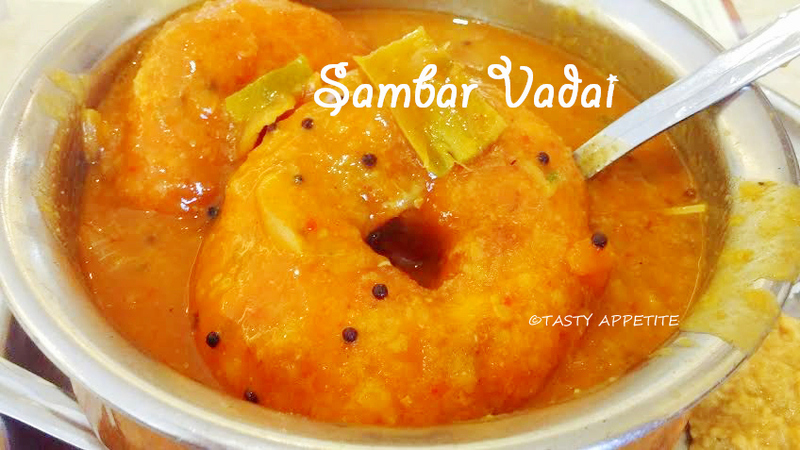 Yummilicious Sambar Vada is ready to relish.